The Tong Peal Uni-Fill is designed to fill big bags or boxes speedily without damage to the crop. 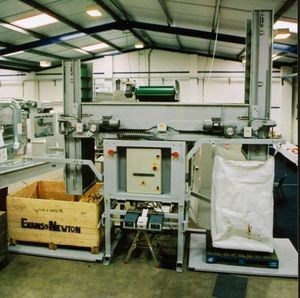 A reversible conveyor feeds the crop to vertical elevators which are lowered into the box/bag. As the crop flows the elevator rises via sensors until they are full. When one elevator has filled the box/bag the crop conveyor is automatically reversed and the elevator on the other side begins. The cycle continues for as long as filled boxes/bags are replaced with empty ones. When using boxes the conveyor and elevator traverse over the box to give an even, gentle filling. Electrical controls include a micro processor, crop sensors and micro switches. There are two automatic programmes. One for boxes and one for big bags. There are also manual over-ride controls on buttons on the panel door. A feed elevator with a 600 mm wide flighted belt can be supplied.